I can not say I was hugely impressed with L’Oreal Color Riche Rebel Blue nail polish, so I felt no urge to immediately try out rest of the polishes I bought from this line. But I did leave them on my desk, so next two finally ended up as my manicure for the day … or two. In the end, I liked Dating Coral (no. 305) and Rose Bagatelle (no. 205) better than Rebel Blue … quality not color wise. Both were easy to apply and with thicker second coat were almost fully opaque + were quick to dry. 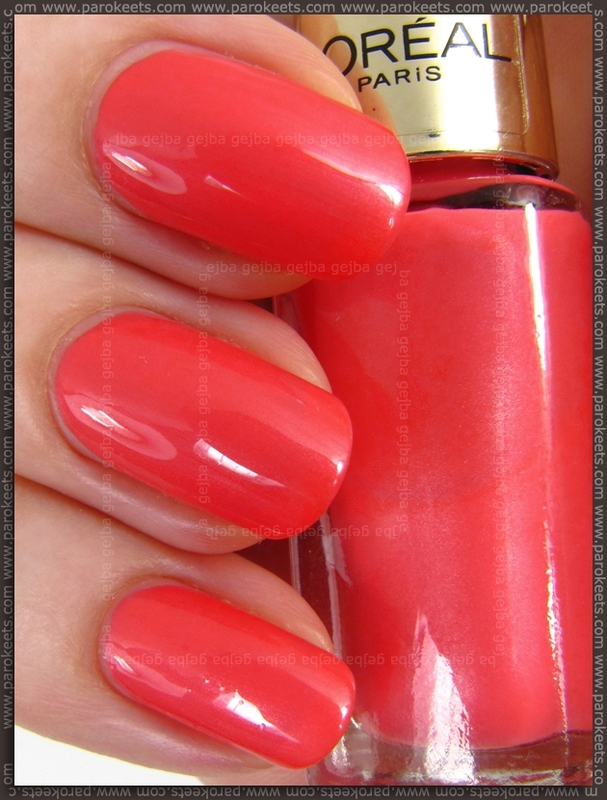 L’Oreal Color Riche Dating Coral is my favorite of the two just because I like the way this coral shade livens up my hands … and goes well with my favorite T-shirt. :D I was afraid that the tiny shimmer will cause steaks, but they’re hardly noticeable. 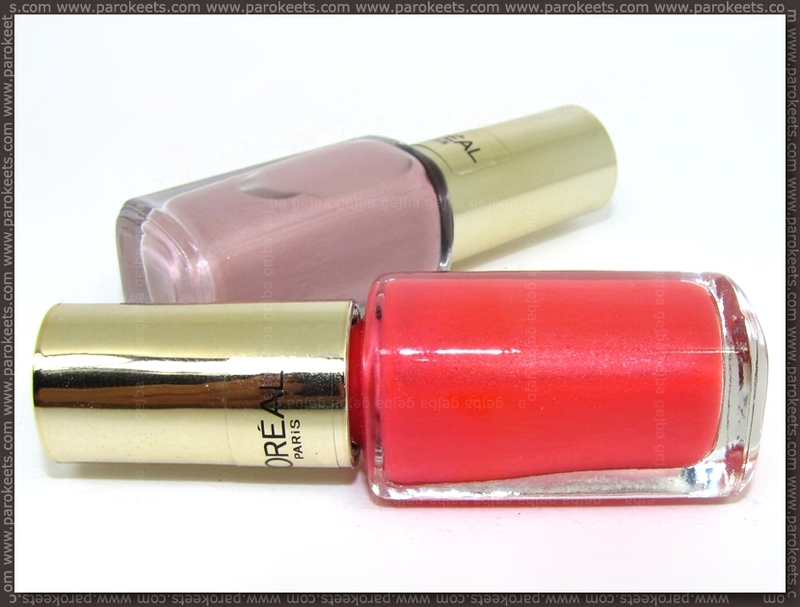 L’Oreal Color Riche Rose Bagatelle is cute taupe-mauve shade great either for discreet manicures or as a base for nail art. 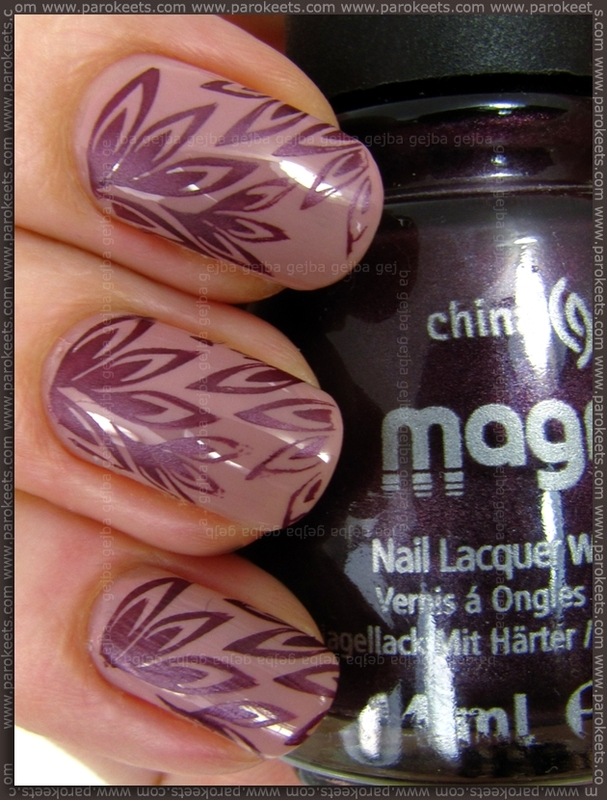 I get easily bored by these kind of colors so I stamped over it with China Glaze Instant Chemistry and Bundle Monster 210 plate. Now I have to go clean my “manicure” desk as it somehow got overcrowded with nail polishes and lots of junk … if I intend to find anything on it of course. Hehe, o tem nisem razmišljala, pa se tudi jaz poleti vedno vračam k nekim koralnim odtenkom, ker tako pristajajo k mojemu najljubšemu dolgemu krilu. Rose Bagatelle sa pečatom izgleda veoma atraktivno.